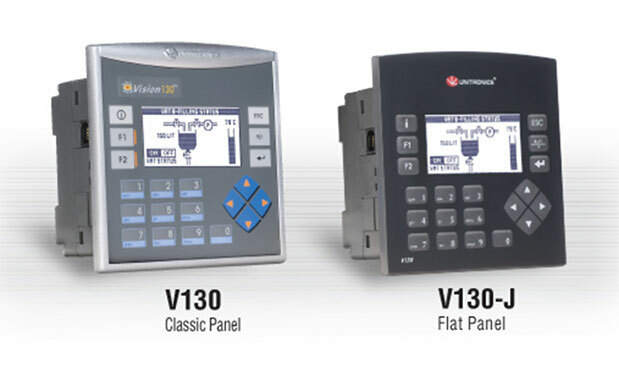 The Vision130™ is a palm-sized PLC with a built-in Operator Panel. The panel offers a graphic display screen and keypad. This small, powerful device supports up to 256 I/Os (onboard plus expansion modules). A rich range of embedded features include multiple auto-tuned PID loops, internal 120K structured data table, loadcell support, and communication options such as Ethernet, GSM/SMS, MODBUS, CANbus, function blocks that enable Vision to communicate with devices using proprietary COM protocols, plus remote access and data export software utilities. The Graphic HMI display screen can show images, text, and graphs according to real-time parameters. It can also display graphs based on historical values, to reflect trends of recorded data. Vision130™ supports up to 1024 user-designed screens, and up to 400 images per application. The Vision130™ is unique: it enables engineers and systems designers to benefit from a powerful PLC and a graphic HMI – within a bare minimum of budget, cabinet space, and wiring.